Create the perfect workplace with Corovan office furniture reconfiguration support. As your business changes, so do your office furniture and workspace requirements. Productivity levels are optimal when people love the space they work in and having the right office furniture and layout make all the difference. Create a “home away from home” for your employees with help from office furniture reconfiguration and installation experts. Whether you need more space at the office or a new workplace arrangement, Corovan can help you maximize your budget, square footage, and existing resources while minimizing downtime. Our workplace experts work with you to design a custom plan to fit your space and budget requirements—from planning to reconfiguration and installation. Our comprehensive suite of furniture and moving services saves you time, money, and headaches throughout the process. Corovan’s office furniture team has the expertise to handle your furniture and assets with care for the reconfiguration. That’s why large corporations trust Corovan to provide office reconfiguration support for their ongoing workplace needs. With professionals who are experienced with major lines of systems furniture, Corovan’s office furniture team can help you install and customize furniture to fit your space. 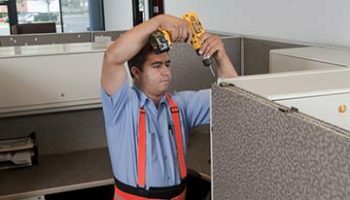 We also provide post configuration support with minor adjustments and light janitorial services. Need office furniture reconfiguration? Contact our experts! 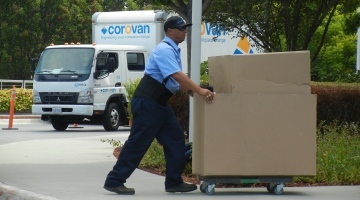 Corovan can help you maximize your budget, square footage, and existing resources while minimizing downtime. Contact UsRequest a Free Quote and talk to our furniture expert today! Corovan Careers – We’re Hiring!